AMD is going to expand their royalty-free FreeSync technology this year with the introduction of Radeon FreeSync 2. If you have already read our FreeSync 2 tech briefing earlier, you know that FreeSync 2 promises to offer HDR gaming with minimal input lag. While waiting for AMD to finalise Radeon FreeSync 2 and its certification program for their partners, let’s share with you our Q&A session with the two key AMD engineers in charge of the Radeon FreeSync 2 project – David Glen and Syed Athar Hussain. AMD Senior Fellow Architect David Glen and AMD Display Domain Fellow Syed Athar Hussain are the main guys heading the Radeon FreeSync 2 project. In this informal Q&A session held on the last day of the AMD Tech Summit in Sonoma, they give us more details on FreeSync 2. An interesting point in this Q&A session is how the wide colour gamuts that many monitors support these days are not being utilised at all. Hope you enjoy it. Sorry about the noise though. There seemed to be some interference from nearby devices. Radeon FreeSync 2 is an AMD proprietary standard, but they will eventually push for it to be an open standard. Radeon FreeSync 2 is not an AMD Vega-specific technology. It is a backward-compatible technology. All GPUs that support FreeSync will support FreeSync 2, via a driver update. FreeSync 2 will not be part of the Radeon Software Crimson ReLive Edition. It will only be introduced in the following Radeon Software edition. FreeSync 2 will support the FP16 and 2-10-10-10 colour buffer formats, that current AMD Radeon Software drivers already support. The AMD FreeSync 2 API will allow developers to quickly add FreeSync 2 capability to their games and game engines. Games that do not integrate the AMD FreeSync 2 API, or use game engines that support it, will not be able to automatically switch to HDR mode, or use the FreeSync 2 transport. The AMD FreeSync 2 monitor certification program will include stringent requirements for low latency (for native and scaled resolutions) and colour space, with an AMD lab to ensure that those monitors meet the minimum requirements. FreeSync 2 will not deliver the colour space of HDR10 or Dolby Vision, but it’s designed to greatly expand the colour space with minimal input lag. The input lag as specified in the AMD FreeSync 2 specifications is defined as the lag from the display flip to when photons are emitted. There will be two-way communications between the monitor and the graphics card. 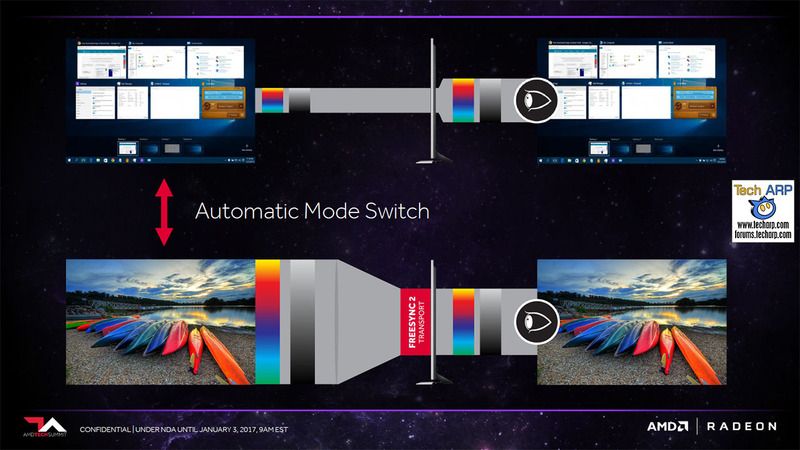 The monitor’s capabilities are conveyed to the graphics subsystem, and the graphics subsystem will instruct the monitor to go into its “native operation mode” to make full use of its native colour space. 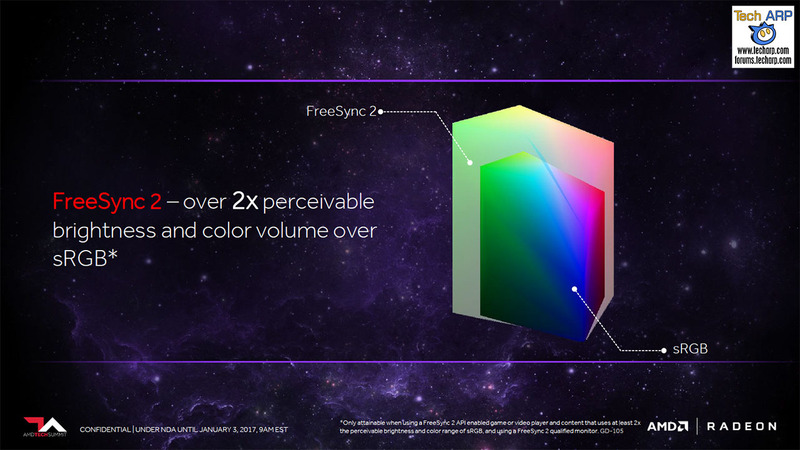 FreeSync 2 will support both active (two-dimensional) backlights and global illuminating backlights. MORE : You can read more about Radeon FreeSync 2 in our article – The Radeon FreeSync 2 HDR Gaming Tech Report. Next : The OPPO R9s Valentine Red Edition Is Still Available! Will a freesync monitor still have freesync capabilities on a freesync 2 gpu? Yes, it will. FreeSync 2 is “backward compatible”, because it’s just a higher set of requirements and certification.